King David Kalākaua (left) signed the 1887 Constitution under threat of force; Lorrin A. Thurston (right) was one of its writers. The 1887 Constitution of the Kingdom of Hawaii was a legal document prepared by anti-monarchists to strip the Hawaiian monarchy of much of its authority, initiating a transfer of power to American, European and native Hawaiian elites. It became known as the Bayonet Constitution for the use of intimidation by the armed militia which forced King Kalākaua to sign it or be deposed. On June 30, 1887, a meeting of residents including the armed militia of the Honolulu Rifles, a group of white soldiers that were secretly the Hawaiian League’s military arm, and politicians who were members of the Reform Party of the Hawaiian Kingdom, demanded from King Kalākaua the dismissal of his Cabinet, headed by the controversial Walter M. Gibson. Their concerns about Gibson stemmed from the fact that he supported the king’s authority. The meeting was called to order by Sanford B. Dole (cousin of then 9-year-old James Dole and chaired by Peter Cushman Jones, the president of the largest sugarcane plantation agency in Hawaii. The Hawaiian League and Americans controlled a vast majority of the Kingdom of Hawaii’s wealth. Lorrin A. Thurston, the main instigator of the subsequent overthrow of the Hawaiian monarchy, prepared a list of demands to the king. The meeting also insisted a new constitution be written. Thurston then became the powerful interior minister although Englishman William Lowthian Green was nominally head of the Cabinet as Minister of Finance. Gibson was later exiled to San Francisco. Over less than a week, the new constitution was drafted by a group of lawyers, including Thurston, Dole, William Ansel Kinney, William Owen Smith, George Norton Wilcox, and Edward Griffin Hitchcock. All were also associated with the Hawaiian League, which had explicitly wanted the end of the kingdom and its annexation by the United States since its inception. Kalākaua signed the document July 6, 1887, despite arguments over the scope of the changes. It stripped the king of most of his personal authority, empowering the legislature and cabinet of the government. It has since become widely known as the "Bayonet Constitution" because of the threat of force used to gain Kalākaua's cooperation. While Thurston and Dole denied this use of coercion and threats, Queen Liliuokalani asserted that Kalakaua’s life was threatened: "He signed that constitution under absolute compulsion." The new constitution was never ratified in the Hawaiian Kingdom's legislature. The 1887 constitution replaced the previous absolute veto, allowed to the king, to one that two-thirds of the legislature of the Hawaiian Kingdom could override. It also took away the power of the king to act without the consent of his cabinet and gave the legislature, which was controlled by the white Americans by this time, the power to dismiss the cabinet instead of the king. It also removed language from the 1864 constitution implying that the king was above the law, replacing it with language that the king was required to obey his laws to the level of his subjects. The cabinet was now allowed to vote in the legislature, but to reduce the king's influence, he was not allowed to appoint legislators to any other government post. The legislature also gained the authority to imprison those that disrespected, published false reports or comments about or threatened or assaulted any of its members. The constitution also removed the monarch's power to appoint members of the House of Nobles (the upper house of the legislature), instead making it a body elected by the wealthy landowners to six-year terms and enlarging it to 40 members. Qualifications to serve as a noble or representative now came to include high property and income requirements as well, which stripped almost all of the native population of the ability to serve in the legislature. 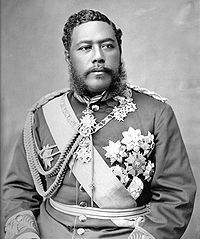 The 1887 constitution had also attempted to limit profligate spending, which had become a problem under Kalakaua's reign, namely with the costly construction and maintenance of Iolani Palace. The constitution stipulated that the King was required to appoint a Minister of Finance to oversee government spending and submit an annual budget proposal to the legislature. The 1887 constitution made significant changes to voting requirements. It allowed foreign resident aliens to vote, not just naturalized citizens. Asians, including subjects who previously enjoyed the right to vote, were specifically denied suffrage. Hawaiian, American, and European males were granted full voting rights only if they met the economic and literacy thresholds. The 1864 constitution required that voters generate annual income of at least US$75 (equivalent to US$1201 in 2019) or own private property worth at least US$150 (equivalent to $2403 in 2019). The wealth requirements were removed during the short reign of Lunalilo in 1874. That change extended voter eligibility to many more Hawaiians and was kept for the lower house. However, the 1887 constitution required an income of $600 (equivalent to US$16731 in 2019) or taxable property of US$3000 (equivalent to $83656 in 2019) to vote for the upper house (or serve in it). That excluded an estimated two thirds of the Hawaiian population. Essentially, only white males, wealthy from the sugar industry, retained suffrage with the Bayonet Constitution. Allocating the government’s power to the Cabinet and then promptly appointing their members to the Cabinet, and securing the disenfranchisement of their opposition, the Hawaiian League seized complete control over the Kingdom of Hawaii. The Bayonet Constitution was the first great implement in the decline of the monarchy. Though it did not depose the King, it did place considerable limitations on his power. Immediately after the adoption of the Bayonet Constitution, the native population of the Kingdom of Hawaii sought to restore King Kalakaua’s power and authority. A committee of Hawaiians met with Kalakaua to discuss dismantling the constitution because the king signed it under duress. According to Thurston, Kalakaua even defended the constitution to protesting natives. Queen Liliuokalani affirmed that he was threatened with violence should he attempt to undo the new constitution. She also listed several petitions from natives that pleaded for a new constitution. Out of 9,500 registered voters, 6,500 signed the petitions. Since the majority of the population supported a new constitution, Queen Liliuokalani proposed one in January 1893. In response, the Hawaiian League overthrew her monarchy and took control of the country. ^ a b c David W. Forbes (2003). Hawaiian national bibliography, 1780–1900. University of Hawaii Press. pp. 232–233. ISBN 978-0-8248-2636-9. ^ a b Anne Feder Lee (June 30, 1993). The Hawaii state constitution: a reference guide. Greenwood Publishing Group. pp. 4–5. ISBN 978-0-313-27950-8. ^ Pat Pitzer. "The Overthrow of the Monarchy." Spirit of Aloha, 1994, 2 Accessed January 27, 2015. http://www.hawaii-nation.org/soa.html. ^ a b c Lorrin A. Thurston, and Andrew Farrell. Memoirs of the Hawaiian Revolution. Honolulu: Advertiser Publishing, 1936. http://catalog.hathitrust.org/Record/001261385. ^ Sanford B. Dole, and Andrew Farrell. Memoirs of the Hawaiian Revolution. Honolulu: Advertiser Publishing, 1936. http://babel.hathitrust.org/cgi/pt?id=uc1.b3477492;view=1up;seq=9. ^ Ralph Simpson Kuykendall (1967). Hawaiian Kingdom 1874–1893, the Kalakaua Dynasty. 3. University of Hawaii Press. ISBN 978-0-87022-433-1. ^ "Appointment of a New Cabinet!". Hawaiian Gazette. Honolulu. July 5, 1887. p. 4. Retrieved July 31, 2010. ^ Wong, Helen; Rayson, Ann (1987). Hawaii's Royal History. Bess Press. p. 196. ISBN 978-0-935848-48-9. ^ Henry Edward Chambers (2009) [January, 1896]. Constitutional History of Hawaii. BiblioBazaar, LLC. pp. 25–27. ISBN 978-1-115-62585-2. ^ Buescher, John. "What Happened to the Royal Family of Hawaii After the U.S. Took Over?" Teachinghistory.org, accessed 1 October 2011. ^ James H Blount, Report of U.S. Special Commissioner James H. Blount to U.S. Secretary of State Walter Q. Gresham Concerning the Hawaiian Kingdom Investigation. Honolulu, HI. July 17, 1893. http://www.hawaiiankingdom.org/blounts-report.shtml. Stephen Kinzer (2006). "A Hell of a Time at the Palace". Overthrow: America's Century of Regime Change from Hawaii to Iraq. Times Books. pp. 9–30. ISBN 978-0-8050-7861-9.